Week 13 (March 26-April 1): Make a list. The letter-writing idea for the week of March 26-April 1 is a fun letter-writing hack: Make and share a list. It could be a list of things you’re doing this summer, places you want to visit, books you want to read, bucket-list items you want to check off, foods you want to try, friends you need to visit, and so on. That list is all related to the fact that I’ve been mostly on my back the past two months, waiting for my lower back/SI joint and knee to recover so I could start running again. And running is the best way for me to keep my head on straight and not get super depressed, especially when it’s cold and gray out. I’ve got the blues, or maybe the mean reds, or possibly a mix. February and March are hard, y’all. By the way, remind me the next time I think I’m having a heart attack that I’m having an anxiety attack, which is a thing that happened three times in March. Ok, so that particular list is a lame one to send a pen pal. Describes self as “a gun-toting southerner”. Unironically lists Applebee’s as one of his favorite “hot spots”. Says he’s “ethically non-monogamous”, whateverthefuck that means. So you can see how lists can be a fun letter-writing hack. 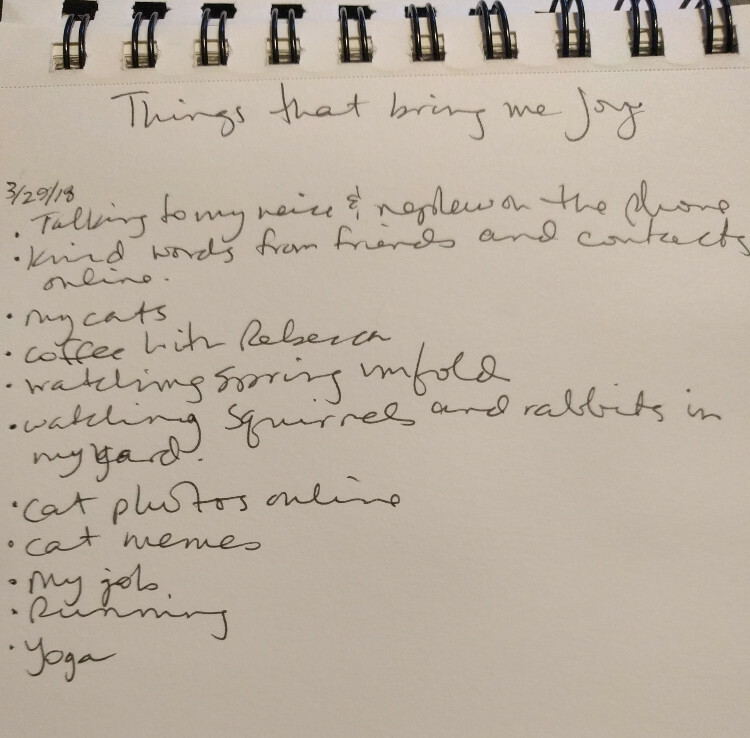 During my most recent anxiety attack, which I’ll briefly discuss in a bit more detail in a future post, I made a list of Things That Bring Me Joy to help distract myself while I brought my heart rate back down. 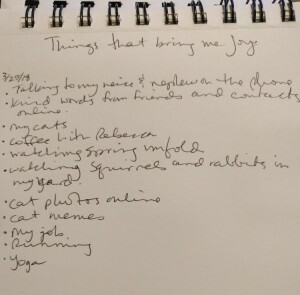 I like to think that cats appear on the list multiple times because Rupurrt was rubbing my arm while I was writing it, but maybe I’ve just paved the way to my future as a crazy cat lady. Either scenario seems equally likely. Week 1 (January 1-7): Send a Happy New Year’s note. Week 2 (January 8-14): Send a Thank You note. Week 3 (January 15-21): Send a postcard from your community. Week 4 (January 22-28): Mail a postcard or letter to another country. Week 5 (January 29-February 4): Mail a Valentine to a pal. Week 6 (February 5-11): Mail a minor. Week 7 (February 12-18): Mail an oldie. Week 8 (February 19-25): Write a note to a pet. Week 9 (February 26 – March 4): Clear out clutter. Week 10 (March 5-11): I see you. Week 11 (March 12-18): Write a letter to yourself. Week 12 (March 19-25): Share a memory.